And the first white snows. And frost by the gate. Thankfully, the Christian group, The News Boys, were in concert locally this month and the church was going and so we all went together and sat together! It was an awesome event! All the songs we knew we sang along with, hands up in praise, enjoying the energy of the large crowd of worshipers all around us. 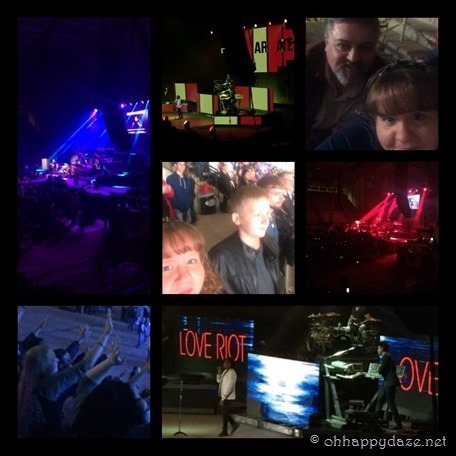 I was the only one in my family that had ever attended a concert before so it was exciting for everyone! They loved it when everyone help up their phones with the lights on and waved them in the air to the Song “Light up the Sky” by The Afters, who opened for the News Boys but they were really impressed when the News Boys drummers stand had hydraulics and lifted up where he was spinning vertically and playing the drums! It was pretty darn cool! I am so glad I got to share this experience with my family!! Anna begged me for months to let her have her 16th birthday party at church. I was not crazy about the idea, I would much rather just stick to family parties at my house and I was concerned that no one would show up. She reassured me that everyone will come if it was right after service on Sunday. Against my better judgment, I let her. All she wanted was to celebrate with her “church family” and play volleyball. 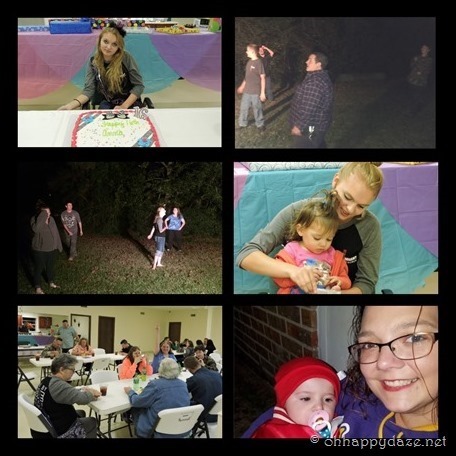 I am so very thankful for my family (siblings, cousins, parents) who are always there for us to celebrate because only a few from church came to the party. She tried to cover up how hurt she was but a mother can tell, honestly, most people could tell. Her cousins rallied around her and took her out to play volleyball, trying to cheer her up…for that, I am so thankful!! I am sure everyone had their reasons for not coming to her party, maybe even good reasons… but at 16… a girl takes it personal. Today my baby girl turned 16!!! I asked her what she would like to do for her special day… she wasn’t real sure and still upset about the party. Finally, I talked her into going out to picnic on Subway sandwiches and hang out at the park. 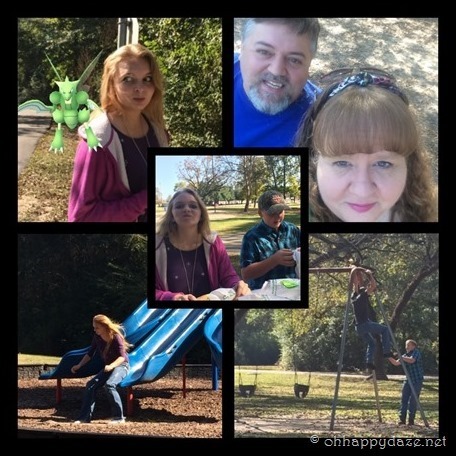 We played Pokémon, played on the equipment and just enjoyed the day. 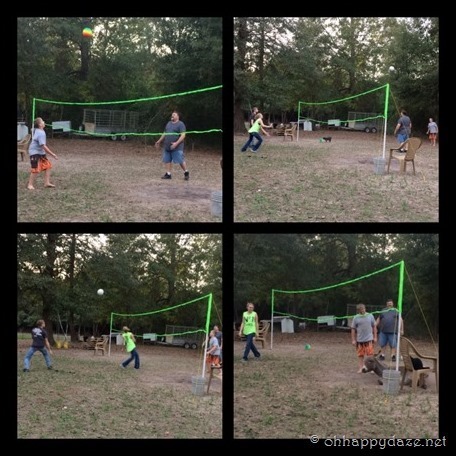 We decided to set the volleyball net up on our garden spot since it is not in use right now! I say it isn’t in use, at least not used for a garden… the donkey apparently has a favorite “roll spot” under the net and tends to interrupt the game pretty often. The kids have been making good use of it and try to play every evening. Hubby and I sometimes join them… It is good practice for them and good exercise for us! 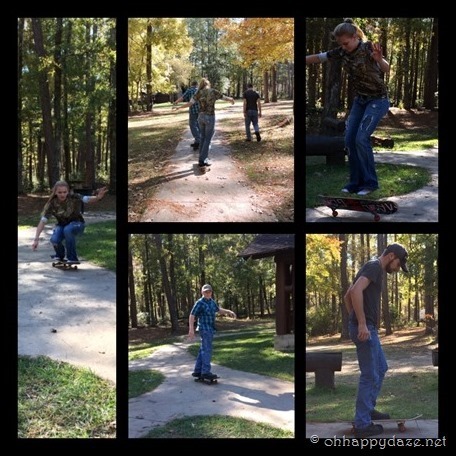 Family bonding at its best! 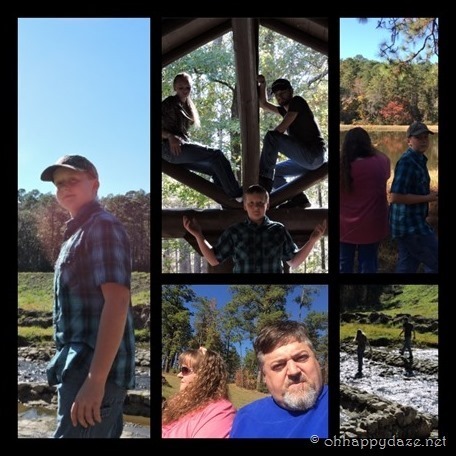 Today was a good day with my little fam of five… we ate breakfast put a roast on in the crock pot, watched the Macy’s thanksgiving day parade, then headed out to grab a geocache at Boykin springs (our first “first to find.”) We wandered around the spillway and took some photos of the changing leaves. The McGee Family Thanksgiving! 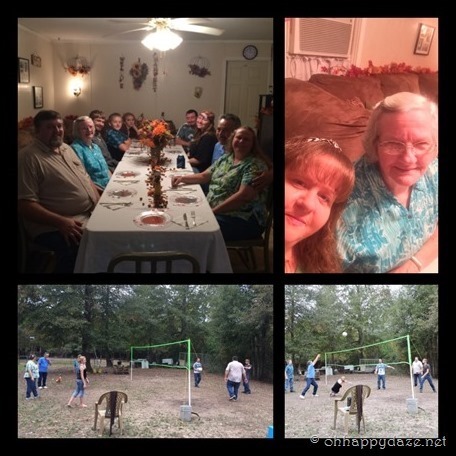 We ate, and talked, and laughed and played volleyball to burn off some of the calories from dinner! And we were thankful! Affiliate Links: Thank you for supporting my blog by purchasing through these links. Christianbook.com carries a wide variety of Christian, Hebrew Roots, & Messianic products along with an abundant amount of homeschool curriculum, inspirational books, movies, music, gifts and more!! Posted on December 3, 2016, in My Journal and tagged November. Bookmark the permalink. Leave a comment.